As big bass vacate their offshore haunts and begin flooding the shallows in preparation for their annual spawn, anglers are afforded a special opportunity. These fish are hungry and territorial which means lots of bites and lots of size. Contrary to popular belief, you don’t have to spend a pile of money to catch these fish. 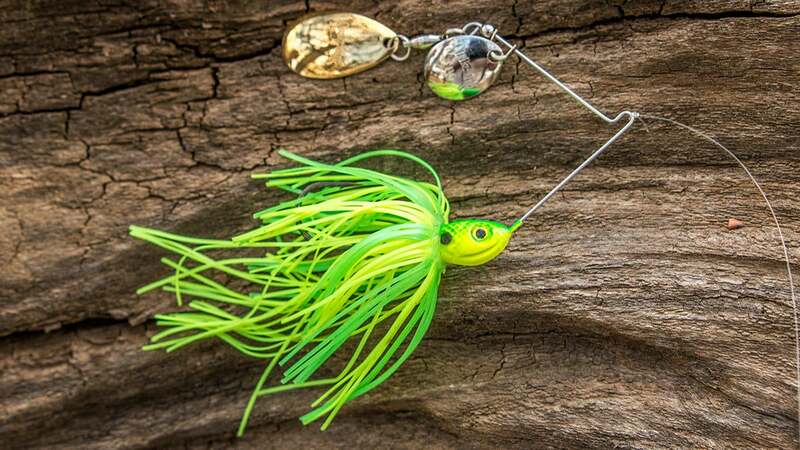 These fishing lures will catch plenty of bass without emptying your bank account. 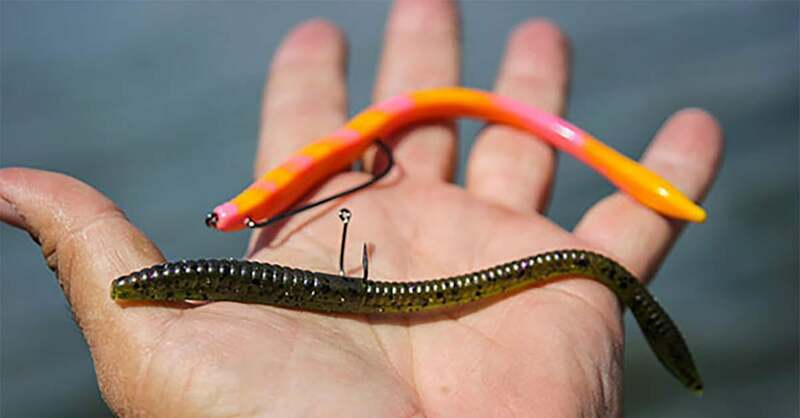 Whether you fish it on a traditional Texas rig, a weightless Texas rig or a wacky rig, this stick worm will flat-out catch bass. Although it works throughout much of the year, the Dinger shines brightest in the spring months. This is an excellent option for targeting bass in all stages of the spawn. It has an enticing flutter as it falls to the bottom on slack line and it has also proven to be quite durable, providing a great value to the angler. You can actually buy them in bulk, which I take advantage of quite often. For just $9.99 you can buy a 30-pack, which equates to a lot of fish catches. I catch roughly two bass on each worm, so you're potentially looking at 60 fish catches per pack. Where to fish it: Casting a Texas-rigged YUM Dinger around vegetation irregularities (small points, pockets or edges) will do some major damage throughout the spring. When the water temperature is above 65 degrees, a wacky-rigged Dinger skipped underneath boat docks can yield outstanding results. If you see bass fry just underneath the surface, you'll want a YUM Dinger rigged and ready. It's one of the best baits for fry guarders that I've ever found. Suggested colors: Watermelon red (clear water) and junebug (dirty water) are just about the only colors you'll need. Simplicity is a beautiful thing. I've found this to be a darn good spinnerbait that won't break the bank. Coming in at only $5.59 on Tackle Warehouse, the value is tough to beat. I've fished this particular spinnerbait in both large reservoirs and small ponds with consistent success. The wire is tough, the blades are coated in either 24k gold or nickel-plated finish, it doesn't roll throughout the retrieve and most importantly, the bass will bite the paint off of it. You can fully expect to catch fish on this spinnerbait whenever the water temperatures are in the 55 to 70-degree range. This has been a legitimate limit-getter for me and has bailed me out of some really tough days on the water. Where to fish it: Slow-roll this spinnerbait just beneath the surface for optimum results. I like to target flooded brush and isolated cover near the mouths of short pockets in the early spring. As the bass start moving towards their spawning grounds, this spinnerbait works quite well on grassy flats. As the male bass guard the newly hatched fry, you can fish this lure around the front posts of boat docks and get a bunch of vicious reaction strikes. Suggested colors: Limetreuse (dirty water) and blue shad (clear water) will cover your bases without a doubt. I just reviewed this frog a week ago, but there's no way I could have left it off of this list. It's too good and it catches too many fish; I just had to include it. You can learn about every little detail of this frog in my full review, but I'll quickly go over the most noteworthy characteristics here. The Pad Crasher only costs $6.69 on Tackle Warehouse and I have several of them I have been using for years without any leaking or tearing. The body is very collapsible which is a tremendous help for solid hooksets, the hooks are razor sharp and do not roll or bend, it walks like a dream and the colors look great. I don't know what else you can really ask for in a topwater frog. It will catch some giant bass whenever the water temperature is over 55 degrees. Where to fish it: Any shallow cover should be a target with the Pad Crasher. You won't get a bunch of bites on it in the prespawn, but they'll likely be big females. As the water nears the 60-degree mark, you can expect to catch both quality and quantity on it. Target grass, laydowns, stumps and the walkways of boat docks with this frog. Make sure you use 65-pound braided line because you'll have a great shot of catching a giant. Suggested colors: Cricket, Night Train and Sunburn are the colors you'll want to start with. To be honest, I don't know if I even own any other Pad Crasher colors. I don't know if there's a more popular bass fishing bait in the world. 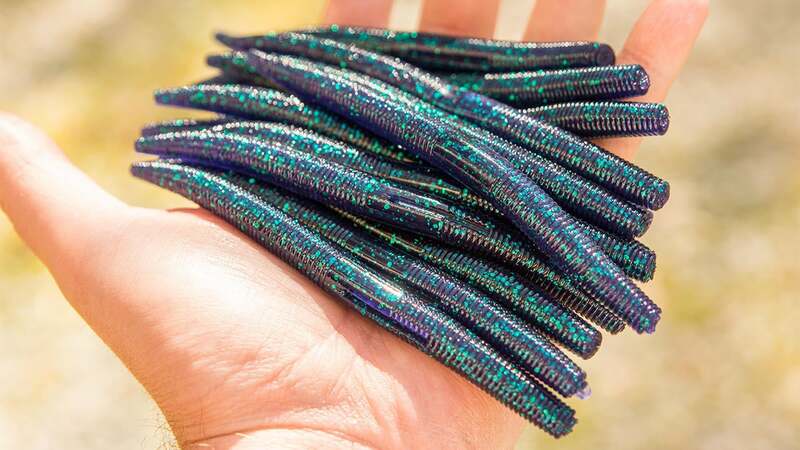 Priced at $4.69 per 20-pack on Tackle Warehouse, the Zoom Trick Worm has an unbelievable action when twitched slowly on a weightless Texas rig. It's widely regarded as one of the best shallow-water bass fishing soft plastics ever made. I like to target shallow cover and slowly twitch a weightless Trick Worm right underneath the surface. I tend to use bright, obnoxious colors for two reasons: Spring bass have a really tough time ignoring 'em and it lets me see the bait throughout my entire retrieve. When the bait disappears, it's time to set the hook. 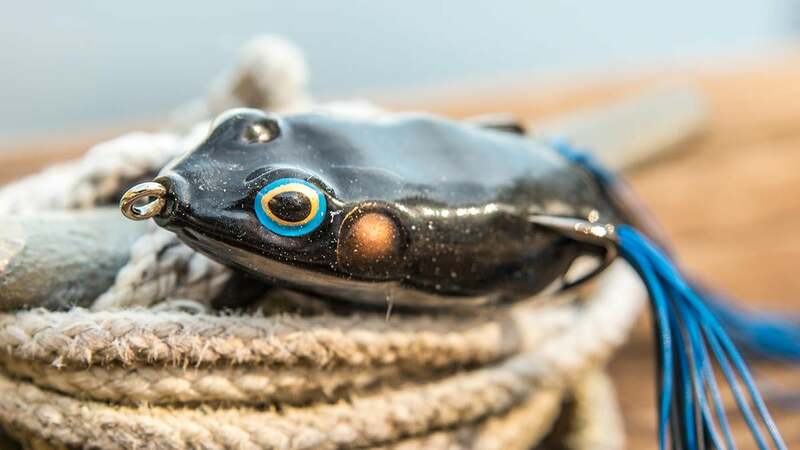 When you're fishing with this bait, it's important to not get in a feeling contest with the bass when you suspect a bite. You won't always feel the bite-it will often be a boil on the surface or you'll see a flash of color as the bass comes up to attack it. If anything feels "mushy" or different, set the hook immediately. Where to fish it: If it's less than 6 feet deep, throw a Trick Worm at it. I wish I had a more technical, smart-sounding piece of advice here, but the darn thing just catches fish. Whether you're in a pond or a big lake, it will produce results. Suggested colors: There are 63 available colors on Tackle Warehouse, but please don't let that mess with your head. It can be overwhelming because all of the colors look pretty cool. But for starters this spring, grab a few packs of White, Bubble Gum and Merthiolate. You won't regret it. It's difficult to overstate the value with this selection. 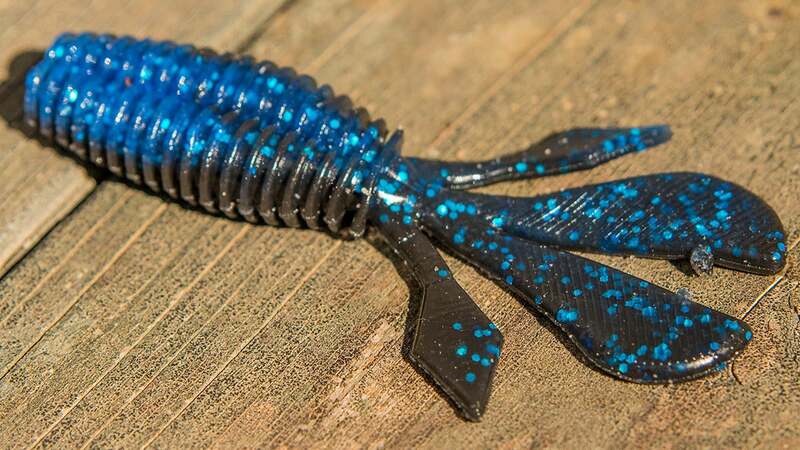 If you're looking for a bait that will catch a bunch of bass without a crazy price tag, the Palmetto Bug is your answer. Priced at only $3.99 per pack, you might have to buy 2 bags to last you all spring. This bait is made from a very unique ElaZtech material that will not rip. It's hard to explain it until you hold it in your hands, but I can stretch a 4-inch Palmetto Bug the length of my forearm without it ripping or tearing. This, of course, translates to incredible value-and efficiency-on the water. Don't be surprised it you catch 20, 30 or even more fish on a single bait. I'm not exaggerating. Where to fish it: The streamlined body of the Palmetto Bug makes it a great choice for skipping underneath hanging cover and punching through thick vegetation. I also like to pitch it in the middle of thick laydowns. Suggested colors: Watermelon Red (clear water), Junebug (dirty water) and Bama Bug (when I can't decide between the other two) are my favorite colors.